The Hotline HLS34 Firedrake 12v Solar Powered Energiser is a multi-purpose unit for general use, whether keeping in horses, cattle, pigs or other animals this unit will perform well. 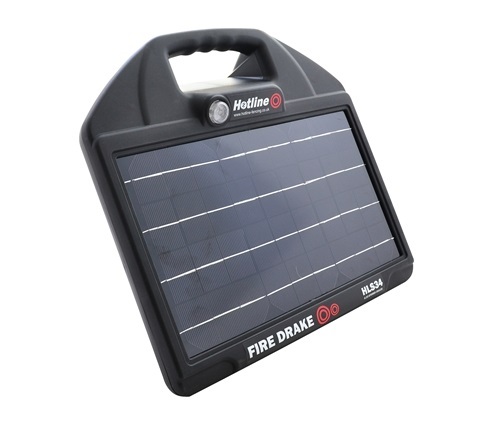 This Firedrake is supplied complete with a 5W solar panel and internal battery. A battery charger is also included to help keep the battery charged during the winter months. This unit has high and low voltage output settings for extra flexibility with the 'low' setting used to extend the battery life when a lower fence voltage is sufficient. Power Supply - Internal 12v rechargeable battery (supplied).